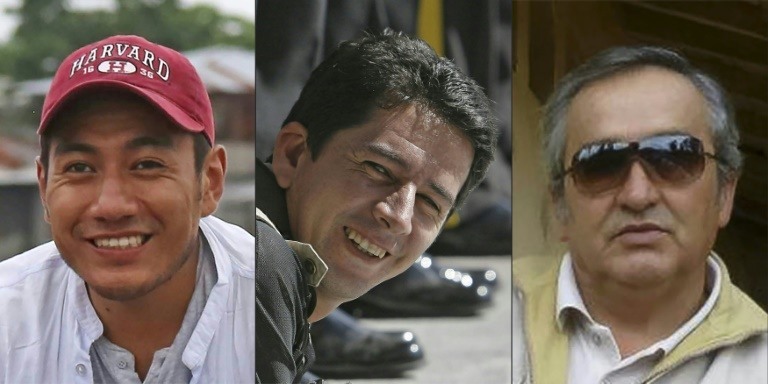 Ecuador on Friday confirmed the deaths of two journalists and their driver who had been kidnapped by renegade Colombian rebels -- and quickly launched a retaliatory military operation in the area where they were snatched. Bogota also sent troops into the dense jungle border zone where the remnants of the Revolutionary Armed Forces of Colombia (FARC) rebel group operate -- a key point on the trade route for drugs destined for Central America or the United States. The killings -- after what is thought to be the first such abduction of journalists on Ecuadoran soil in three decades -- have shaken a country unaccustomed to the cruel violence linked to trafficking that has ravaged Colombia. The three men, who worked for the influential El Comercio newspaper -- were kidnapped on March 26 while covering a story on violence along the border, where Ecuadoran forces have been battling Colombian rebels engaged in drug trafficking. Speaking in Lima, where he was attending the Summit of the Americas, Colombian President Juan Manuel Santos denounced the murders as "a deplorable act," confirming his troops had also been sent in. "We have included the drug-smuggling terrorist Guacho on Ecuador's most wanted list and we are offering a reward of $100,000 for any information which leads to his capture," Moreno said. But as his own boss, and without anyone to answer to, the rebel chief could change his mind on a whim, "depending on circumstances," Vinueza explained. The murders were roundly denounced by governments in the region and beyond, with Costa Rica expressing its "absolute condemnation" of the bloodshed and Spain denouncing it as a "vile and criminal act." "Our coverage is very unusual because it is filled with emotion." 0 Response to "Kidnapped Ecuador journalist team confirmed dead"